Man, it's cold. Undergoing a bit of a deep freeze over here with temperatures dropping to -15 C (about 6 F for ya fellow Americans) making it: A. a pain to escape the warm embrace of my bed B. and giving me a yearning for some down home comfort foods. And while all of life's fun little duties prevents me from doing much anything about the first thing, the latter is putting mandu, also known as dumplings, on my mine quite often lately. Mandus are more commonly associated nowadays as a street or snack food, served at street carts or bunshik joints. Even at any standard Korean grocery mart, you'll be able to see bags of various frozen premade mandu that are readily available to cook and eat at home in a matter of minutes. But anyone who has made mandu before will know these bad boys take up some serious time and labor. Which is all the more sad knowing that the cheap, mass-made frozen mandu varieties with a lot of filler ingredients have replaced the general status of mandu as a real laborious effort that yields ample rewards as well. Jaha Sohn Mandu is located in the dainty neighborhood of Buamdong, just northwest of Gyeongbokgung (Gyeongbok Palace). Like the charming neighborhood, the restaurant is housed in a snugly renovated house just above the Jaha tunnel. The story goes that the owning family used to simply sell the entirely homemade mandus just outside their house but as word spread of their quality and taste, their popularity grew and they decided to convert their old home into a full restaurant. As the "sohn" in the restaurant name implies (sohn means "hand" in Korean), the mandus here are all prepared and made by hand and has been doing so under three generations of the same family. Housed on a hill, the spacious house has an elegant yet (literally) homely feel to it as though you're being invited to someone's abode for a meal. Right off, Jaha Sohn Mandu lets you know that when it comes to making food, they are serious. Everything from the kimchi here to their soy sauce is made in-house and they take great pride in making everything locally and in season. Dumplings, dumplings, dumplings galore is on the menu. You have your standard boiled dumplings containing beef, pork, and other goodies (7K), steamed dumplings (5.5K), and pyeonsoo (5.5K and more on this dish below). Kimchi mandu, vegetarian mandu are also both 5.5K and a special seasonal mandu made from eomnamu shoots (6.5K). Eomnamu is a special plant I think translates as "kalopanax". The shoots are a delicacy in spring and, as such, the mandu is also seasonal. They also have a special cold bean and rice cake soup using these eomnamu dumplings when they're in season (13K). A regular cold bean noodle soup (12K and also known as kongguksu) and then a pyeonsu cold soup (9K for small, 15K for large). Both the latter two are only available in summer. On a side note, these trio of dishes are very uncommon in Seoul, let alone Korea. You have then your regular mandu dishes including mandduguk (12K),ddeokmanduguk (12K), and mandu jeongol (37K for small, 49K for large). These three are probably the most popular dishes from Jaha Sohn Mandu. The rest of the dishes are sides that can be eaten with your meal or as an anju with drinks. They also carry a few teas and tea house snacks. I've mentioned this before but one of the best indicators of a great Korean restaurant is simply by examining their kimchi. And at Jaha Sohn Mandu, what a sight their simple kimchis are. A roll of crisp, spicy and tart kimchi that's been freshly cut before serving. Bite-sized kkakduki with sheen that shouts freshness. So as the menu shows, prices are a bit higher than an average 7-8K meal. For many who consider mandu a nondescript, casual snack more than anything, spending 12K for a bowl of mandu soup may seem exorbitant. This is a rather unfortunate shift in paradigm as the labor intensive mandu were enjoyed by the high class and even royals of the past when the pouches were stuffed with the best ingredients. And after our first mandu (the pyeonsoo) came out, I knew Jaha Sohn Mandu was of the same vein. Pyeonsoo is a lesser known variety of mandu but is generally associated with the Gaeseong region in North Korea, just a few hours north of Seoul. "Pyeon" literally means "flat" or "piece" and "soo" means "water" and is said to come from the mandu's unique shape making it look like pieces floating on water. It's actually interestingly enough a summer dish in which beef is joined with blanched and wrung slices of mushroom, cucumber, squash, etc, and then wrapped in a unique square shape. After steaming, it can be eaten as is dipped in sauce or it can be placed in a cool broth and served as a summer dish that's traditional to the Gaeseong region. Here the Pyeonsoo is served plainly steamed and with thin wrappers. But inside you can see they are filled up almost to the max. And any doubts on quality is thrown out the door when you sample these treats. The thin but flavorful strips of tender beef, chewy shiitake mushroom slices, and notes of the fragrant cucumber comes together beautifully to make a simple yet memorable mandu. This is definitely unlike any regular mandu you can get in Seoul and are well worth sampling. Two of the establishment's signature dishes- the manduguk and the ddeokmanduguk- also embodies elegance right away visually. In fact, there's even a regal air to it and you can even imagine that such a dish would be served and presented before the king in the past. This isn't your standard manduguk where the bowl is almost entirely soup and you have to fish around with your spoon to find a tiny mandu here and there. The manduguk here is served in a compact bowl to bring together the giant mandus which have been meticulously arranged in a spiral pattern and graced on top with a simple topping of shredded and seasoned beef and a bit of green onion strip garnishes. The soup just fills in the space but what's clear is this: the fist-sized dumplings are the star here. The wrapping for the mandus for the manduguk is noticeably thicker compared to the pyeonsoo and the density adds weight to the mix of ground pork, beef, vegetables, and sprouts. It's seasoned enough on its own but cut into one and add just a bit of the homemade soy sauce with just the right mix of sweet, savory, and tart and it adds just enough extension to bring the thick starchy texture and flavors of the mandu wrapping and the mix of flavors and textures from the filling within. If we're anthropomorphizing the dishes, the manduguk is like the brawny strapping king and the ddeokmanduguk is like the noble and sophisticated queen. Instead of the immense and rough size and shape of the mandus from the manduguk, the mandus in the ddeokmanduguk is smaller and shaped in a way it reminds you of a flower in spring. This analogy is only heightened by the cheery colors which are derived from natural sources such as spinach, carrots, and beet. Really it's such a nice visual that even if you're not one of those who normally snap shots of your food, you'd be hard pressed not to do so with the ddeokmanduguk here. Look how perfectly they fit on your spoon. Another unique aspect about the ddeok, or rice cake, that goes into the ddeokguk here is that they don't use the oval-shaped ddeoks that are more common but go with the johraengee variety (조랭이떡). These gourd-shaped (or snowman-shaped depending how you perceive them) rice cakes are more common in the North and because of their density, have a bit more chew to them than the oval-shaped rice cakes. As bold as the presentation is, the flavors here aren't of the knock-your-socks-off-right-away variety. The beef broth is mild and soothing and very clean in taste but it serves as essentially a flavor "plate" of sorts for the mandu. And the mandu themselves, as you can see by the pictures of the filling, are gentle in flavor. There's not an excess of flavors such as from copious amounts of garlic and red pepper flakes. Instead, it's the beauty of the subtleties in flavor and aromas that one can appreciate in the mandu. They're pricier mandus and mandu dishes but one can't argue that the dumplings by Jaha Sohn Mandu aren't subtle and high quality. Obviously meticulously prepared and thought-out, the establishment rightfully places great pride in the sourcing, preparing, and serving of their food. One major issue with Jaha Sohn Mandu is its accessibility- or lack thereof. There isn't a close subway station nearby so the best way is by car (such as a cab) or by bus. 1. Come out of Gyeongbokgung Station exit 4 and walk straight for about 50 meters until you get to the major 4-way intersection. 3. 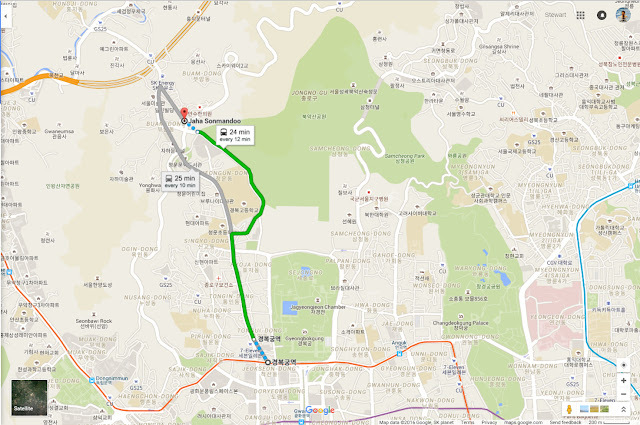 Board bus 7022 and go 5 stops to get off at the Jahamun Hill, Yoon Dong Ju Literary House stop (자하문고개.윤동주문학관). 4. 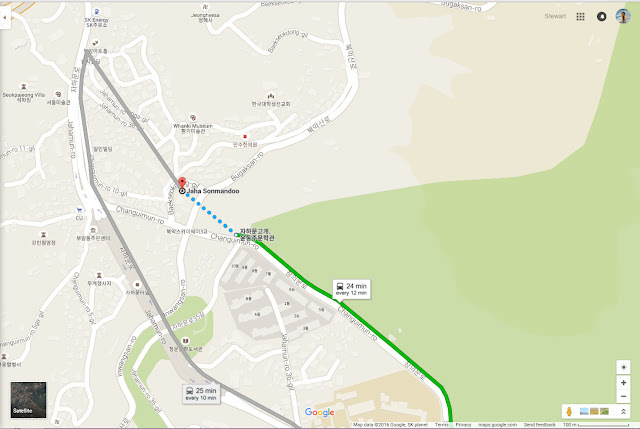 Walk straight about 100 meters, passing Changuimun (Changui Gate) and a 4 way intersection along the way, until Bugaksan-ro (Bugaksan Road) is on your right. 5. Follow along Bugaksan-ro for about 50 meters as you go up the curved hill and you'll see Jaha Sohn Mandu with parking lot attendants in front. http://www.sonmandoo.com/ (Though the homepage seems to be down). Various Korean alcohol and drinks available. Some of the menu items are seasonal (winter/summer). Jaha Sohn Mandu also sells frozen varieties of their dumplings that are premade and, as I recall, were great in value as well (equal or less than the cost of factory-produced frozen mandu bags). If you're making reservation for the indoor space, ask if any of the window tables are open as the views of the Buamdong region is quite superb.